This is a portrait of dancer, performer and teacher Chazz Young. 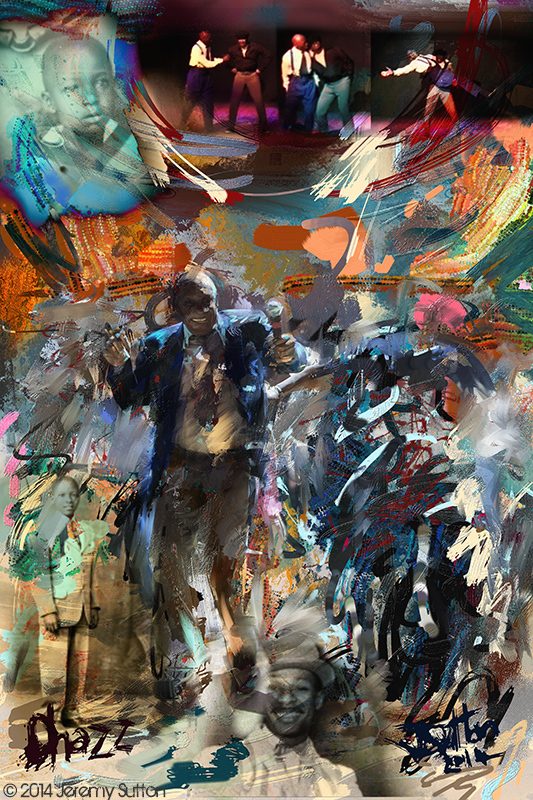 It features him leading the Shim Sham at Frankie 95, a celebration of his dad, Frankie Manning, legendary pioneer and Ambassador of Lindy Hop dancing whose Centennial (Frankie 100) was celebrated around the world on Monday, May 26th, 2014. BREAKING NEWS: Chazz is recovering from a stroke and needs our help. Please visit this Chazz Young Back in Step crowdfunding page aimed to help with his medical-related expenses. In the upper portion of the portrait you can see three views of Frankie and Chazz performing together to “It Ain’t What You Do (It’s the Way That You Do It)” by Jimmy Lunceford. 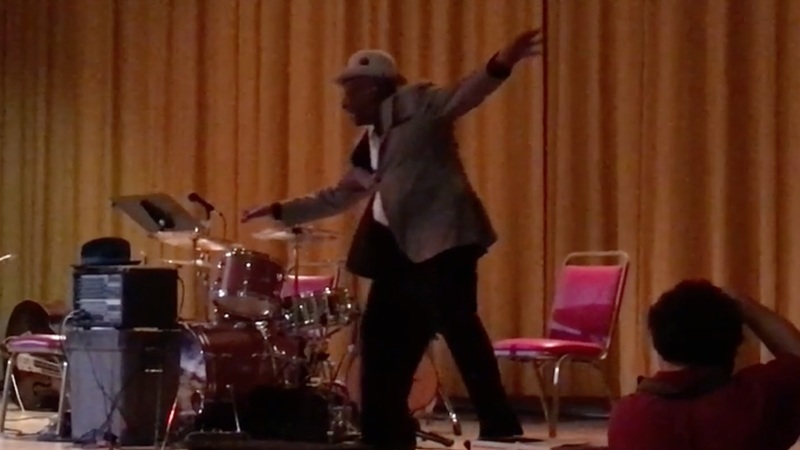 To learn more about Frankie and Chazz I recommend viewing the wonderful video documentary “Frankie Manning: Never Stop Swinging”, produced and directed by Julie Cohen. This painting was created using Corel Painter and a Wacom tablet on a Macintosh computer. I started by experimenting with all the new brushes included in the Extra Extras set here on PaintboxTV (see the close up details of the brush strokes shown below). I ended up with one of my new favorite brushes, David Gell‘s Eliron from his Inkspiration brushes, which reminds me of the looseness of painting with twig and ink. 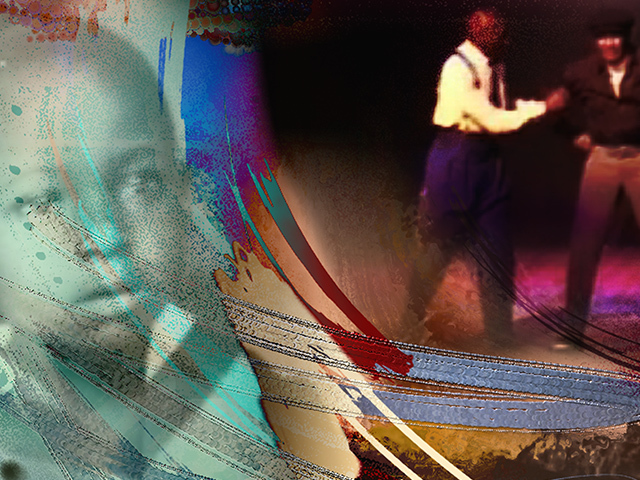 Other portraits in this series of Lindy Hop legends include Frankie, Dawn and Norma. 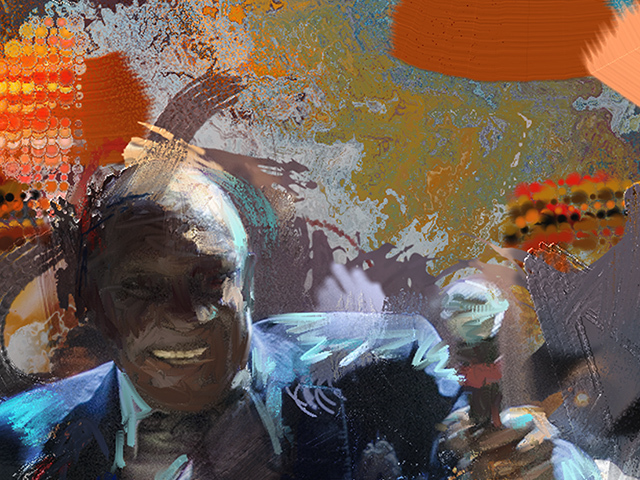 These paintings were displayed during the Frankie Manning Centennial celebration in New York City, May 26, 2014. After Frankie 100 I sent Chazz his portrait which he framed and hung in his house. 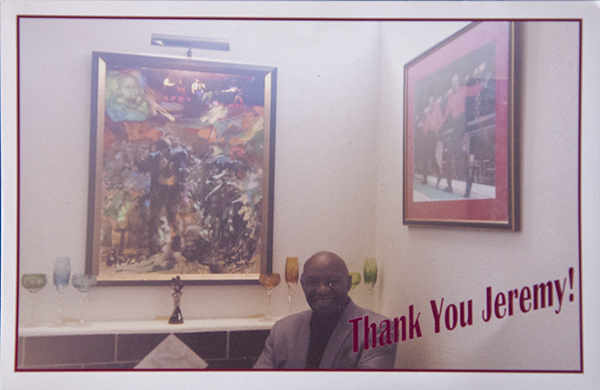 He then sent me the nicest thank you note (see below). His heart felt expression of how much this painting means to him is the greatest gift I can get for creating art. Thank you Chazz for inspiring this painting and being such a wonderful, warm, appreciative portrait subject as well as amazing dancer, teacher and performer! Hi Jeremy we met outside your space on Bryant street. You pointed me to BAVC across the street. Love the Chazz work. The work is really alive an so full of movement. Great how this was done all digitally too. I hope to run into you again.